Please check out our Membership section for more information. 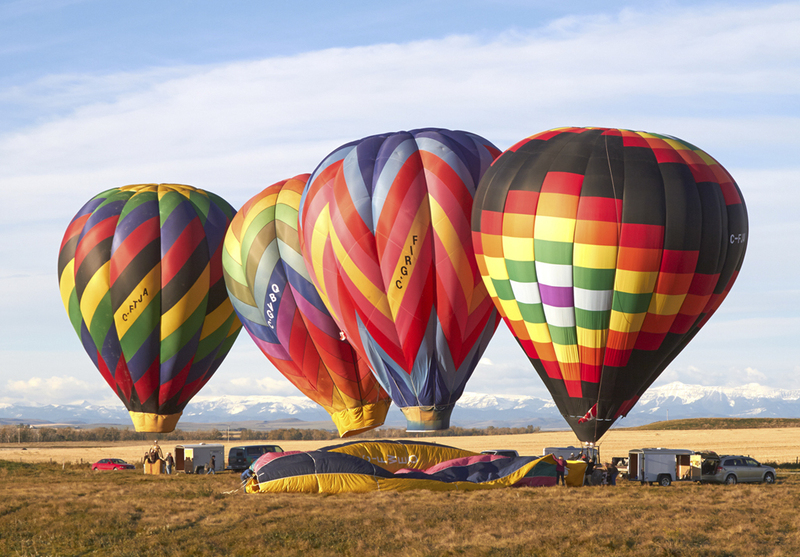 The Calgary Balloon Club meets at the Hangar Flight Museum (formerly the Calgary Aerospace Museum 4629 McCall Way NE) on the second Wednesday of every Month at 7:30 pm with the exception of July, August and December when there is no meeting. Can you fly balloons in the winter? Yes, many of our flights take place in the winter, and our club members enjoy flying at winter-themed events such as the Vernon Winter Carnival. Provided that it is not too cold and the wind is not too strong, we will fly. Ballooning is a weather-dependent sport. Flights can only be completed under ideal conditions, which is why most flights happen in the two hours after sunrise and the two hours before sunset. Flight cancellations are most often caused by wind; balloons fly best in stable winds of 4-6 miles per hour. If the wind is over 10 miles per hour on the ground, or 20 miles per hour in the air, it can be both difficult and dangerous to fill, fly and land the balloon. In high winds, the balloon envelope acts as a sail and can cause the balloon to roll around. Additionally, high winds during a flight can make it difficult for a pilot to control the balloon and can blow the balloon into areas that are unsafe to land in. Are there other balloon clubs in Alberta? In Canada? Yes, we have lots of friends! You can see all of them by checking out Friends of Calgary Balloon Club. Ballooning 101: The basics of hot air ballooning. Crewing 101: Basic information on what you’ll do if you decide to help crew. Competitive Hot Air Ballooning 101: Competitive ballooning is a whole other world, and this is a glimpse inside. Becoming a Pilot 101: Once you have caught the ballooning bug, you’re going to want to fly yourself. This is how you do it.